LARGE CAPACITY: Keeps things organized. 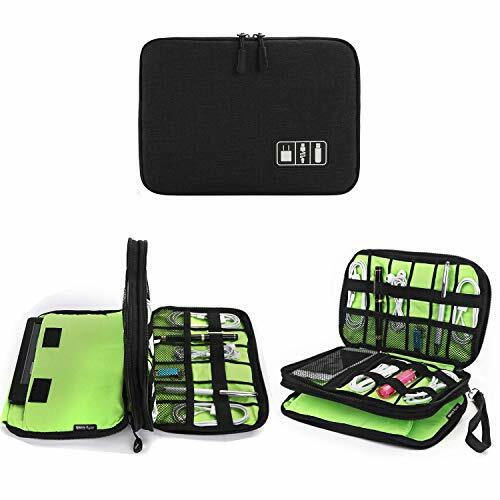 The electronics storage bag has 2 layers Nylon interior compartment with enough space to take in your cables, USB drive, cellphone, charger, mouse, kindle, mini tablet and other accessories. STRUCTURE: 6 elasticized mesh segments for usb drive, 2 Mesh pocket for chargers cellphones, 12 elastic loops for cables, 1 SD/TF card storage segment, 1 big adhesive pocket for tablet iPad mini, 3 detachable hand strap. EXQUISITE DESIGN: Waterproof nylon surface prevent water forcible ripping, ensure the safety of your. 4 premium zippers bring make it easier to open/close the bag to take your charger. high elasticity loops keep your chargers and cables in place. PAD STORAGE CASE: One layer has a pad storage case for your mini tablet, kindle and pocketbook. Tips: This Organizer bag fits for iPad Mini(7.11-inch) but not enough for iPad Air & Microsoft Surface. MULTIPLE USAGE: Well padded semi flexible covers offer excellent protection for your electronic accessories. Beside, the storage bag is also suitable to store pens, pills and makeup. Best for household and tourism using. PORTABLE and CONVENIENT: Perfect for Traveling. Just open the case and check if everything is there, preventing you from leaving things behind. The small size and lightweight design allows you to carry the bag with the hand strap. It also fits your briefcase, luggage and backpack without taking much space.